The Bavarian Military Merit Order (Militär-Verdienstorden) was established on July 19, 1866 by King Ludwig II of Bavaria. It was the kingdom's main decoration for bravery and military merit for officers and higher-ranking officials. Civilians acting in support of the army were also made eligible for the decoration. 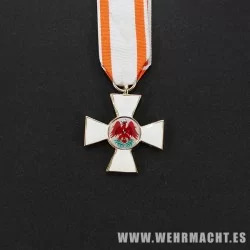 The Military Merit Order ranked below the Military Order of Max Joseph (Militär-Max-Joseph-Orden), which was Bavaria's highest military honor for officers (and conferred a patent of non-hereditary nobility on officers who were not already nobles).